Renewables are the most popular energy source in the UK. According to government statistics, 78 per cent of the public support them, with only four per cent against. In November, countries across the world committed to take action on climate change, and to do that they must go low carbon. The North of England led the Industrial Revolution, and it should be at the forefront of this new, global, cleantech transformation. To spread that message, we teamed up with 10:10 and commissioned an interactive art installation in Manchester's Piccadilly Gardens for an evening. 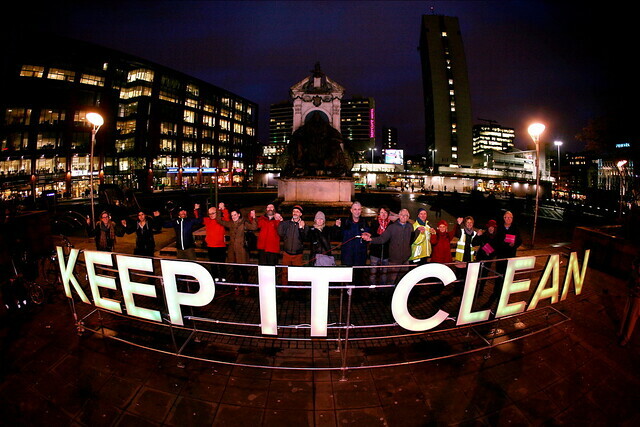 One-metre-high letters spelling out 'Keep it Clean' lit up when people held hands to connect the electric current, and changed colour when more joined in. We invited passers-by to interact with the sculpture by holding hands and making the bulbs light up, and passed out leaflets to explain what it was all about – making sure that whatever comes of the Northern Powerhouse idea, it has clean energy and the wishes of northern people at its heart. Alongside the installation, 90 organisations from across the North signed a declaration calling on the Chancellor to power the Northern Powerhouse with clean energy. The signatories include the Greater Manchester Combined Authority, communities investing in their own small-scale renewable projects, business groups, faith groups, and nature conservation organisations.